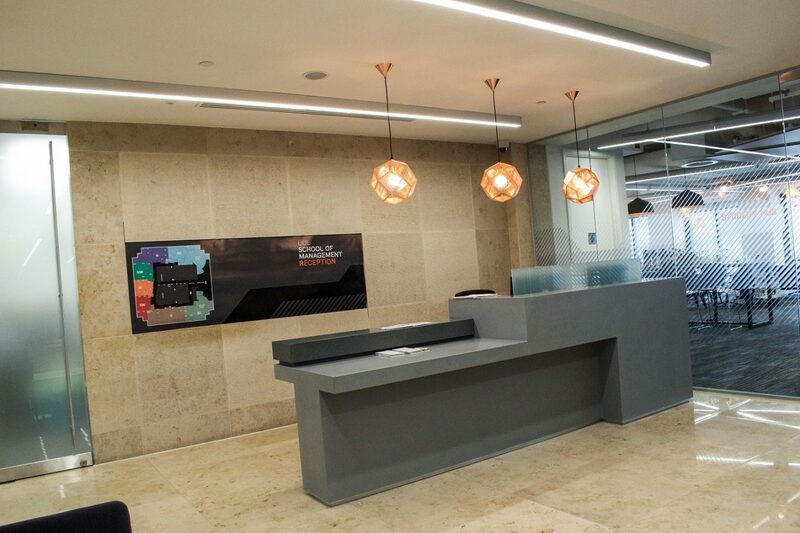 The new development is purposefully located in Canary Wharf with the objective of bridging the gap between academia and business. Keeping the intended audience in mind, the brief prescribed Audio Visual infrastructure for spaces to be used for classroom instruction, as well as groupwork, seminars, exhibitions and other live events delivered by leading business personalities. The facilities had to be at par with infrastructure guests will be accustomed to use in Corporate offices. Given the ambition of the School to become an ‘ideas factory’ for business leaders in Canary Wharf, the brief prescribed infrastructure and functionality designed to support the identified pedagogical approaches of the department, while minimising the aesthetic and physical intrusion of the AV equipment in the spaces. Speakers/Lecturers have 4x Shure MXW wireless microphones, DDA compliant assisted Listening Induction Loop System (designed to compensate for furniture and room materials- reduce signal loss and control the amount of induction audio signal spillage), and 1x pair of front mounted QSC speakers supported by multiple ceiling mounted programme speakers and pendant speakers for voice reinforcement. audio signals from microphones are fed in to the loop system, lecture capture, streaming and used for sound reinforcement via the ceiling speakers as required. The Echo 360 Lecture Capture suite performs the function of creating distribution-quality content for the school. The system is supported by Acoustic Magic microphone arrays, HD PTZ ceiling-mounted camera, ceiling-mounted Wolfvision VZ-C6 series visualiser (with own light source), lecture capture recording system and Extron H.264 Streaming Media Processors. The system allows the user to record onto a memory stick/external hard drive and live stream from the lecture theatre to anywhere on campus. In keeping with the brief, all AV equipment are housed within the rack located in dedicated AV rack rooms. Wall-mounted Crestron 7” touchpanel allows the user to control the complete AV system and lighting- power on/off, volume control and system input selections made to the displays and projector, lecture capture recordings and video Streaming are also initiated and ceased from the panel. Bring Your Own Devices can be connected to the system via an HDMI and/or VGA and Audio connection presented at the lectern position. These rooms have a standardised set of group study/teaching facilities and vary from 12m2 to 21m2 (6 to 8 seating capacities). This is a 30-seat seminar room with teaching across the width of the room.  Two strategically mounted microphone arrays for lecture capture and induction loop feeds. 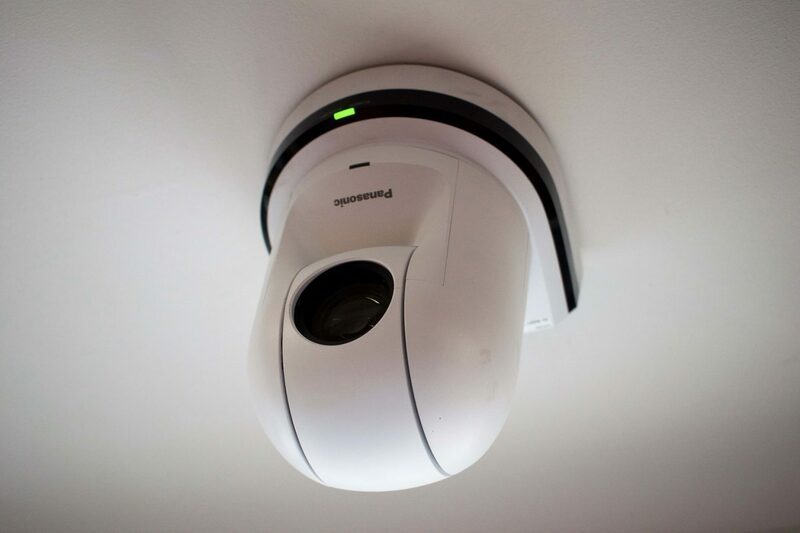  HD PTZ ceiling mounted camera for Lecture Capture.  Ceiling Mounted High Resolution Wolfvision Visualiser with Built-In light source.  Hardware Mounted/stored in purpose built rack housed in a cabinet. The boardroom isn’t designed for direct learning and teaching- they serve the same purpose as meeting rooms in any corporate office setting. For example, employers may use the room to interview graduates or organise meetings with academic staff.  PTZ video conferencing system with IP phone to allow USB connectivity for soft VC conferencing.  Hardware Mounted/stored in purpose built rack to be housed in client supplied cabinet. 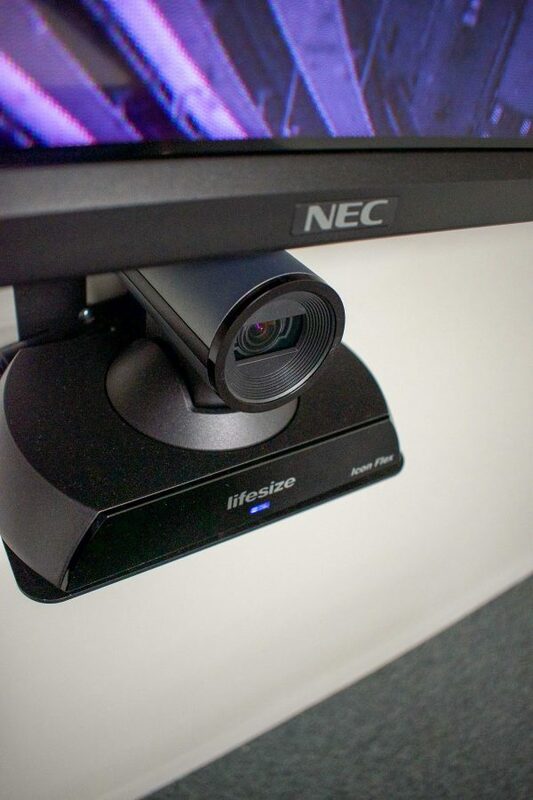 Video Conferencing (VC) is available via a PTZ camera mounted beneath the display on a purpose-built shelf, and connected to a client supplied PC positioned in the rack cabinet. An IP phone which also uses the built-in microphones and speakers for audio pickup/reproduction is also used for VC. 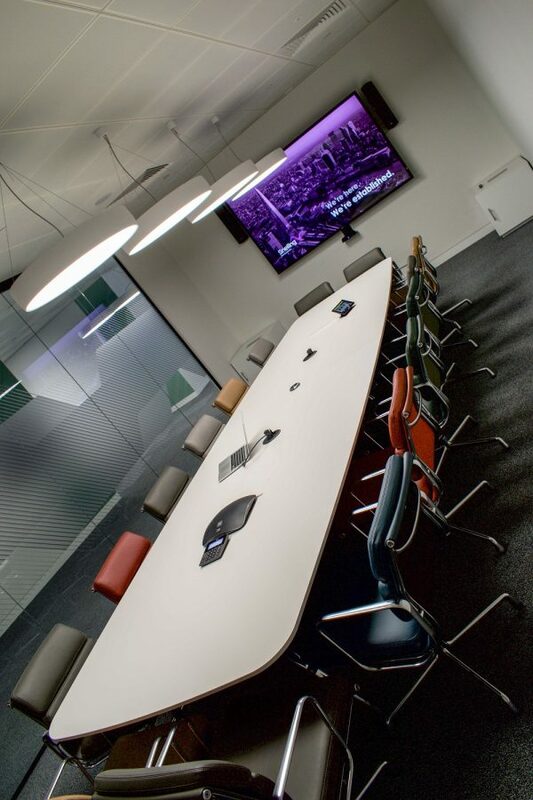 All VC functions are controlled from the touchpanel on the phone unit once the user selects ‘Video Conferencing’ on the Crestron Control Panel. 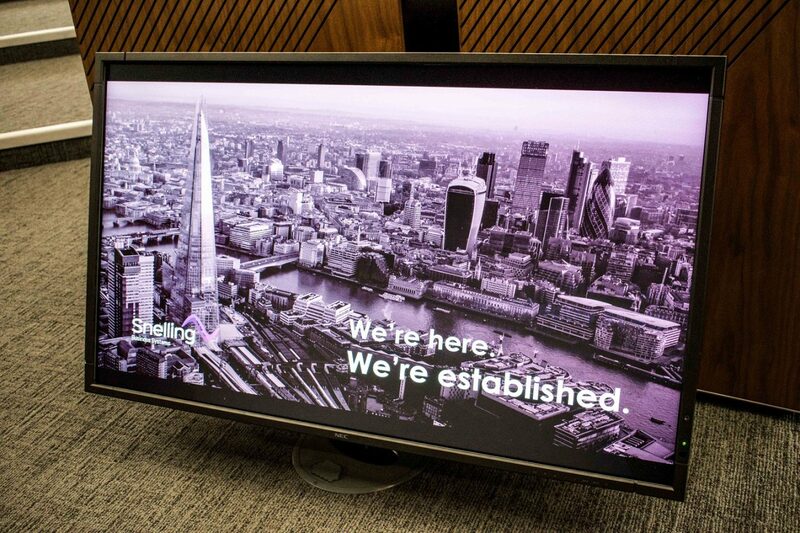 Bring Your Own Devices can be connected to the system via an HDMI and/or VGA and Audio connection presented at two different positions on the Boardroom table. 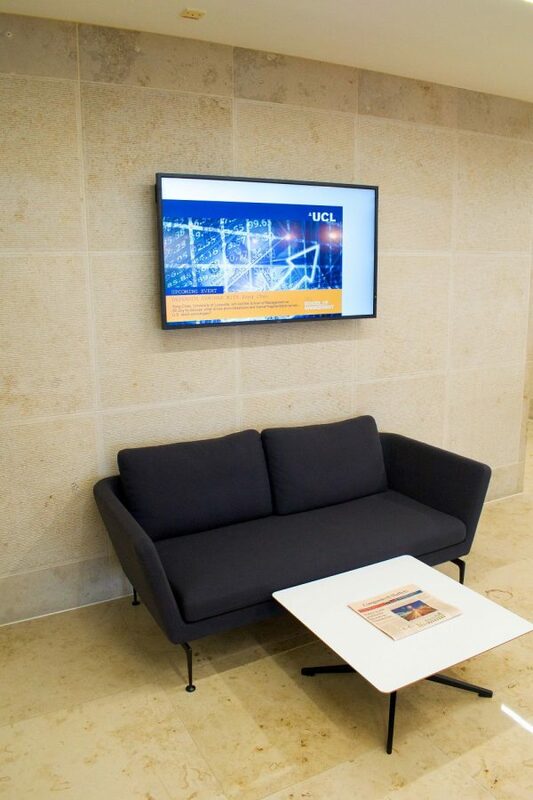 OneLan Digital Signage receivers are mounted behind each display and connect over the client network to the client supplied server, which has the Content Management software. Content can be created offline, uploaded and scheduled remotely by all authorised administrators. 1. 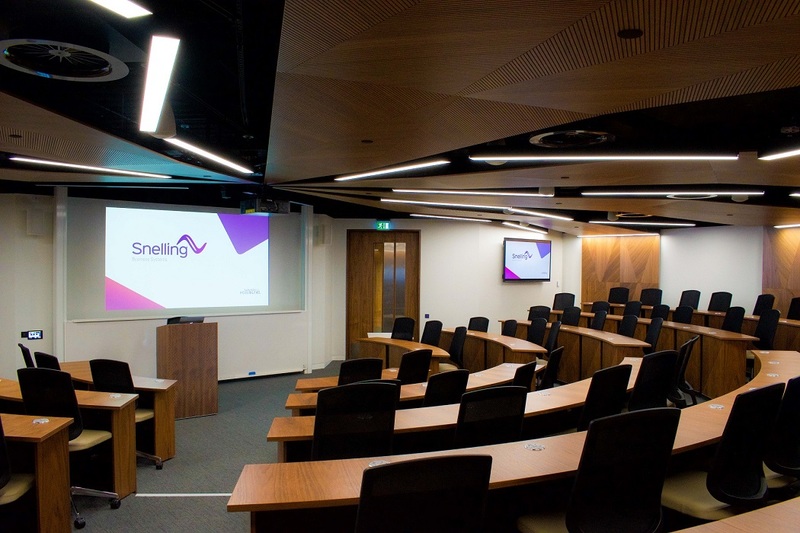 Effortless wireless presentation and collaboration: teaching spaces are equipped with wireless presentation capabilities, with supporting hardware to aid speakers/lecturers in a live setting. 2. 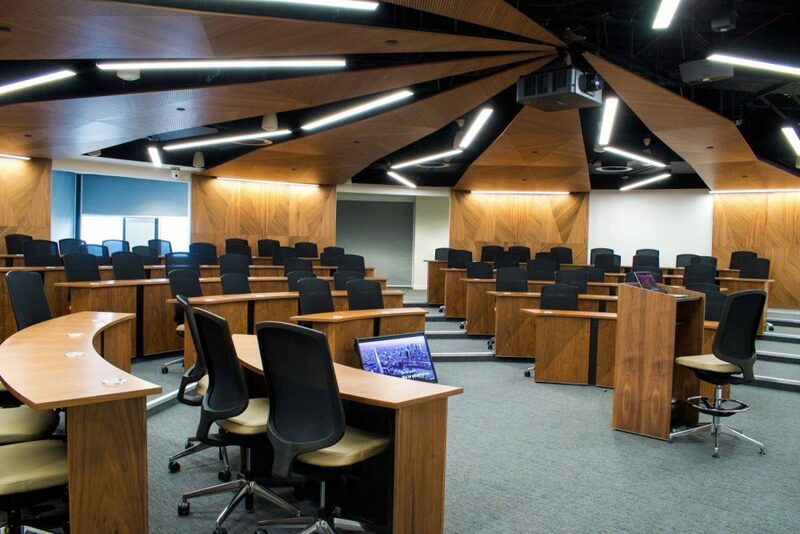 Lecture Capture Ready: Teaching spaces are equipped with HD cameras, as well as speaker tracking microphone arrays, alongside recording and streaming hardware accessible to administrators. 3. BYOD: with the wide involvement of corporate partners, all spaces allow users to use their own devices for audio and visual applications, as well as live presentations from fixed lecterns. 4. Minimal hardware clutter: keeping with the client brief, the system was designed to function ‘behind the wall’.